Water hyacinth is a free floating aquatic plant that grows in still or slow moving fresh water bodies it has become one of the world's worst aquatic weeds due to its ability to rapidly form dense floating mats on the waters surface. These mats have significant impacts to rivers, wetlands, lakes, dams and irrigation systems (see NSW WeedWise for information about water hyacinth). In 2012 water hyacinth was named as one of the additional twelve Weeds of National Significance due to its invasiveness, potential for spread and severe impacts. 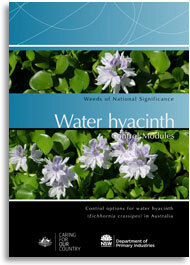 These modules present best practice advice for the control of water hyacinth in Australia. This advice is based on a review of over 100 papers on water hyacinth management and ecology from Australia and overseas. The modules in this series have been designed to be used together, or individually as required and provide a basis for the development of site specific management strategies in Australia.